Swiss Wing (simplified Chinese: 瑞士鸡翼; traditional Chinese: 瑞士雞翼; Jyutping: seoi6 si6 gai1 jik6) is the name given to a kind of sweet soy sauce-flavored chicken wings served in some restaurants in Hong Kong. It is marinated in sauce made up of soy sauce, sugar, Chinese wine, and spices. Despite the name "Swiss," it is unrelated to Switzerland. Instead, it is believed to have originated in either Hong Kong or Guangzhou. There are no concrete answers as to the source or the name of the dish. 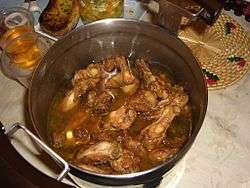 One story goes that a Westerner came across the dish "sweetened soya sauce chicken wings" in a restaurant, and asked a Chinese waiter what that was. The waiter, who did not speak perfect English, introduced the dish as Sweet Wing. The customer misinterpreted sweet as Swiss, and the name was used ever since. However, this story may be a mere urban legend. 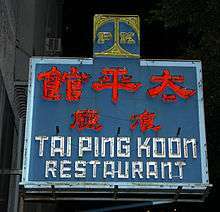 Some claim that the dish was invented by a local restaurant, the Tai Ping Koon (太平館) (zh:太平館餐廳) . It is a common practice in Hong Kong restaurants to name a new dish after a place, which may or may not have any connection with the dish itself at all. Swiss Wing is also featured in the TVB cooking variety series So Good. ↑ wantanmien (2010-04-03). "Hong Kong style Swiss sauce chicken wings 瑞士雞翼（Cantonese）". youtube.com. Retrieved 13 August 2012. History of Tai Ping Koon Restaurant from their website.